Sarah Nyamwenge and Lady Crane - Shining an International Light on Talented Artists! My chance connection with Sarah Nyamwenge - founder of Lady Crane, Lady Crane International Fashion Show and Lady Crane Charity - was one of those amazing opportunities that could only happen in social media. Not sure HOW we first got connected as friends, but I noticed she had a fashion event coming up and asked if there were media passes. Somehow the fact it was in Uganda, not Vancouver, totally escaped my radar. It took a few emails to sort out. In the end, this meeting was a meant-to-be. Just a week ago she asked if I would like to come and be a part of the May 10th Lady Crane event. If you know me, you know I love hearing people's journeys. What an amazing chance this was to meet individuals from a totally different environment - artists, models and more - who could share their unique journeys with me. I would be there in the role of international media with the mission to shine a spotlight on the incredible talent found here. There are glitches arising that may mean this journey might not become a reality, but things on my side are moving smoothly - a doctor visit for prescriptions, a travel clinic for shots only they could give and an emergency application for a visa - so I chose to think positively. What a better way to spend Mother's Day for me than embarking on a grand adventure? Should things not work out I will be unbelievably sad, but regardless of the outcome it is my privilege to share a bit about the founder, Sarah Nyamwenge and her vision. Enjoy! Oh, and cross your fingers for me! I was born in Gulu district where my father was working as a train driver and my mother a housewife. I grew up in Kampala City with my parents, six sisters and two brothers. I am second born. What were you like a child and as a teen? Were you always interested in Fashion? I was a very reserved child, very shy, got bullied a lot by my little sister and classmates in school... Ha ha ha... However, I became a professional model in my early teens, so that set me apart miraculously since it gave me so many friends even though my shy aspect was not taken from me. I never thought of fashion at all. Yes I loved fashion like any other young girl growing up. But with my type of background of both religious and traditional parents, the only dream I had was to become a train driver. Left - her first catwalk steps on the runway at the tender age of 15! I know you were a professional model for 15 years. How were you discovered? What was it like working all over the world. I was discovered by East African Modelling and Talent Convention, an agency that trained, groomed me as a model and opened my life to the world's international runways. After a few years, I became the catwalk instructor of some top beauty pageants in Africa like Miss University Africa, Miss East Africa, Miss Uganda for 2 years and Miss Tourism Uganda. My experience around the world was not a straight path at all...lots of hills and valleys that made me bow whenever I got uphill. But the beauty of the looks on my family and friends' faces plus their emotional expressions of joy, pain, surprise, excitement and so on when ever I return with brand new experiences, just make me love my progression more. If I give details of this, we would take a full day of reading. Do you have any favourite stories from this time? Yes, and my story is actually outside fashion. It was at 7 years old after kindergarten in the city when my parents took me to live with my grand parents as well as start my Primary School in a village in Tororo, a 6 hour drive from the city. My first day in school was a very exciting experience as I walked with my grand father to school where he left me. Switching from writing with a pencil in the book to using short sticks on the ground was totally interesting. At midday when the bell rang for children to go back home, I noticed the hardest part of the school uniform 'bear feet with no shoes for all pupils' as the biggest punishment. The sand on the road had been heat so hot by the sun, that I could hardly step with my little feet. Other children kept running home. But even the once green grass that had turned pale yellow on the sides of the path due too constant hot sun could not help cool my feet. A distance of 10 minutes walk, took me about 2 hours to get home. The next day I decided to wear my shoes, though took them off again to feel comfortable with the village children whose parents could not afford shoes. After a few days, I got comfortable with the hot sand. This went on for a whole year, then I was taken back to the city for the rest of my education. Today, I use my fashion event as a charity to donate clothes, shoes and educate the children in villages. Talk about founding the Lady Crane Fashion Collection. I founded Lady Crane International Fashion Collection as a platform to promote talented and outstanding African designs to the world. I use some of my former beauty queens from different African countries in this cause. Right image - Miss Uganda 2012/2013 Fiona Bizu with Duke Water owner Maryam Shebe. 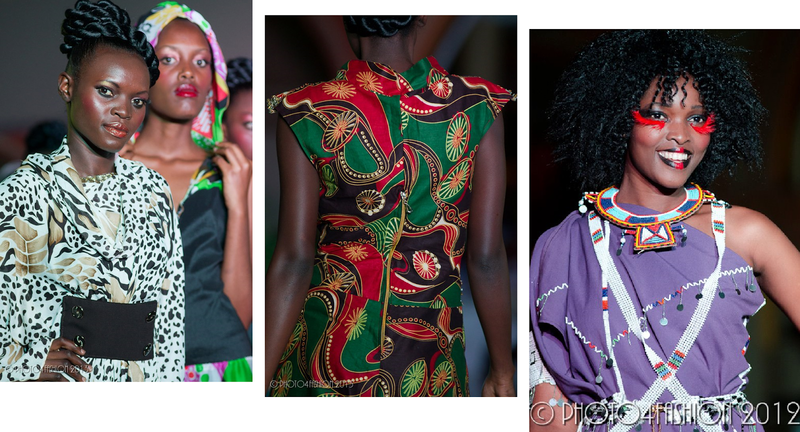 I am very excited to be coming to the Lady Crane Fashion Show on May 10th in Kampala and would love to hear your journey to founding this amazing international showcase of Ugandan talent. I noticed so many pending outstanding talents that sought international recognition in Uganda. so I decided to put all of them together with a good cause to benefit children, so that both the artists and children benefit annually. The first show was in March 2012 with three countries attending, the second show in 2013 had up to ten countries. The major challenge I face is that I am just Sarah Nyamwenge. So sponsors have been slow at responding because of that. But I love the growth rate of the event, especially by African people who are now starting to appreciate art. Can you share a favorite moment from a previous show? My first show in 2012 had barely 100 guests, but 2013 guests more than doubled in number, a reason why the hotel manager's speech had the statement, ' Lady Crane, you made it again in a bigger and better way, we are proud of you'. That was very uplifting to me because I always focus on producing the best out of the stylists. Who are some of the talented artists we'll see on the runway at Lady Crane 2014? We will see Artists/designers like Stella Atal, Brenda Maraka, Martha Jabo, MIUBU, Vonda Africa, Korabhai - all from Uganda - and John Kaveke from Kenya, Ziza Creation from Gambia, Guy Maza and Krysbel from Burundi. There will also be poets like Kagimu Joshua from Uganda, and lots of traditional dance and music performances. In a nutshell - what would you like the world to know about the amazing talent in Uganda. What unique do they have to offer. First of all, the setup of Uganda - traditionally and culturally - differs in many ways because of the regional structures (east,west,north,south and central) that are completely different in dressing, language, food and lifestyle. The Fashion designers each belong to totally different backgrounds which means they have a unique art creativity separate from one another. Some of the jointly used material in Uganda for garments, shoes, bags etc include the backcloth which is created by hitting the back of a special tree (the back cloth dress) until a big layer of material falls off. It will be showcased on the runway. After the show, the shoppers and collectors are always free to purchase whatever impressed them from the stalls. Do you have a philosophy that guides you on this journey? My philosophy in life is, ' Always pick an obstacle big enough that it matters when you overcome it. Nothing significant is ever accomplished by a fully realistic person, so all that is necessary to break the spell of inertia and frustration by acting as if it were impossible to fail'. To purchase tickets online go to - http://eatickets.com/. For more information, media inquiries or to make a donation to the Lady Crane Charity visit the website at www.ladycrane.com. As I have attended and run several events over the last 10 years, I know how important sponsors are. They are the lifeblood that no event could operate without. Sponsors for the Lady Crane International Fashion Show include - Brussels Airlines, Duke Water, WBS, Speke Resort, Fairway Hotel and Spa, Darling Uganda, D.Spot Salon, Club Rouge, In Motion Dance Studio, Target Digital Agency, and Photo 4 Fashion. Please support these great businesses!